To ask other readers questions about Delivering Happiness, please sign up. I had the privilege to get a signed copy and listen/watch his presentation on 'Disruptive Innovation' t. It seems like he had me in mind when he came up with the concept years ago. How about you readers of this book? Tony Hsieh has some nerve suggesting that he built a billion dollar company in pursuit of happiness. But the surprising thing is I actually think he's onto something. Something that cuts through a lot of corporate BS and really makes sense. Tony's thesis is basically that, whatever our intermediate goals in life are (get your dream job, make a lot of money, find the right girl, etc), our ultimate goal is simply to be happy. And what's more, (this is the key), happiness in life has to come from y Tony Hsieh has some nerve suggesting that he built a billion dollar company in pursuit of happiness. But the surprising thing is I actually think he's onto something. Something that cuts through a lot of corporate BS and really makes sense. Tony's thesis is basically that, whatever our intermediate goals in life are (get your dream job, make a lot of money, find the right girl, etc), our ultimate goal is simply to be happy. And what's more, (this is the key), happiness in life has to come from your job as much as your personal life. Tony lays out a framework for how he personally has used happiness to create a very unique and successful culture at Zappos - and how he personally came to that conclusion in his own life. I heard Tony Hsieh speak several years ago, and from that had one key takeaway: that instead of spending marketing dollars acquiring customers, just have mind-blowing WOWingly good customer service - and your product will spread naturally - as people will tell their friends about their good experiences. It's harder to calculate the ROI, but it's something that makes a lot of sense, and we've definitely incorporated it into Goodreads. 1. Perceived control: people need to be in control over their own fate. At Zappos reps can earn up to 20 different skill sets or "badges", and each one represents a pay raise. It's up to the employee how much money they want to make. 2. Perceived progress: nobody likes to feel like they aren't going anywhere. At Zappos they give smaller raises every 6 months instead of bigger ones annually. 3. Connectedness. Studies show that engaged employees are more productive, and the number of good friends an employee has at work is correlated with how engaged the employee is. I found this one most interesting. 4. Vision/Meaning/High Purpose. People need to believe in something bigger than themselves. The book Good to Great discusses how the truly great companies in terms of long term financial performance are those with higher purposes beyond making money. This I do believe, which is why on the Goodreads about us page our mission is stated as "to get people excited about reading". - Tony walked away from $20 million dollars because he didn't want to waste a year being miserable working for Microsoft. - Tony spent every cent he made from the $265 million LinkExchange acquisition in keeping Zappos afloat. Again - admirable. - The Zappos Core Values actually help the company quite a lot, as they've made believing in their core values a core value. - The Core values are the way to keep the culture strong, because they are guidelines for people hiring to keep the desired qualities and traits. Each core value has different interview questions, and employees try to gauge new candidates on each value using these questions. - Zappos believes so much in it's culture that Tony created a program to teach other companies how it did it - called Zappos Insights. I haven’t read many business books, but when the “Delivering Happiness’ bus came to my workplace, I received a free copy, so I thought I’d give it a try. I understand that this isn’t a ‘tell all’ or an autobiography, but what you get is a scrubbed clean Channel One telling of how to succeed in business without really trying. In a time when many people are anything but happy in their workplaces, I found the book to be more of a guide to start a Fraternity, except without any mention of drugs and a I haven’t read many business books, but when the “Delivering Happiness’ bus came to my workplace, I received a free copy, so I thought I’d give it a try. I understand that this isn’t a ‘tell all’ or an autobiography, but what you get is a scrubbed clean Channel One telling of how to succeed in business without really trying. In a time when many people are anything but happy in their workplaces, I found the book to be more of a guide to start a Fraternity, except without any mention of drugs and alcohol. For real, you can’t have a whole section about how great Raves are without mentioning Ecstasy. The advice comes off as disingenuous when even the stories of the worst times could have happy faces at the end of each paragraph. I’ve always been very suspicious of crow baring the importance of ‘culture’ into business. It seems to me that trying to hire people you want to be friends with would eventually result in group think. It’s hard to argue, though, when Hsieh has millions of dollars and I have dozens of dollars. From my experience, though, the amount of stress a company puts on how much fun they have, the less fun they are in reality. I’ve read that newer generations are less engaged with their jobs as a lifestyle and place family and friends first, not really mixing the two. I wonder how these attitudes will mesh with the intense, “Your coworkers are your family now” philosophies. I much rather have a professional, structured work environment, with a product that I understand and believe in, and make money equal to the amount of energy I put forth. 1)	Hsieh’s story makes you realize how much you should support the Entrepreneurial spirit in kids. I was always trying to start businesses as a kid, so it was funny to hear about his trial and errors. 2)	I love the theory of giving people a two grand out if they quit after the initial training. Not every job is the right fit for everyone. 3)	The idea of call centers being treated as a valid business careers. No call times, no scripts, but instead hiring and training people to do their jobs professionally. 4)	Building a pipeline of talent – having clear paths of how you can grow professionally. I loved this story the unique way they developed this wonderful company. Their moto, respect for each other and love of their customers is something I wish more businesses would aim for. They risked it all, they believed and they won the golden ring but they aren't relying on that ring to carry them, they are always striving for being better. There are amazing firsts, and fumbling fails but never a giving up or giving in. I loved following the path of the most resistance with Mr. Hsieh and friends. Inspirational ? heck yeh this book is good for the developing mind and opens the mind to dreams of what could be. One of the best books about business, and personal happiness, I've ever read. I found it so inspiring and I can't wait to use what I've learned with OwlCrate. To anyone out there who owns a business, big or small, I highly recommend you read this. Nice and honest account of Tony Hsieh's history. I'm not sure how much of his success I account for his 'genius', or simply his being in the right place at the right time. I wonder if his devotion to Zappos was really based on his gut instinct that the company would succeed, or if that is a story he has told himself to cover the fact that he was simply desperate to have it work since all of the other efforts he had funded had failed and he had wasted his riches on partying and 'finding himself'. Nice and honest account of Tony Hsieh's history. I'm not sure how much of his success I account for his 'genius', or simply his being in the right place at the right time. I wonder if his devotion to Zappos was really based on his gut instinct that the company would succeed, or if that is a story he has told himself to cover the fact that he was simply desperate to have it work since all of the other efforts he had funded had failed and he had wasted his riches on partying and 'finding himself'. Regardless, I feel the 'going for broke' mentality he portrayed is not something to aspire to - and is more akin to seeing someone win the lottery after buying a million tickets and thinking 'hey, he's a genius!' - and trying to do the same. Don't get me wrong - Hsieh defiantly made Zappos into what it is, and I love the start-up, entrepreneurial attitude...I just don't think his story is very inspirational, and people are in awe of him because of the halo effect of the Zappos sale. I'm not sure that Mr. Hsieh really knew what he was doing most of the time. He was obviously quite young when he enjoyed his initial success with LinkExchange, and it's hard to tell wether or not there was ever any sound basis for the decisions he made. I liked his ideas on 'Ask Anything', and how a business should be obsessed with its customers in order to remain successful over the long term. The book also provides some interesting insights as to what it was like to start one's career right at I'm not sure that Mr. Hsieh really knew what he was doing most of the time. He was obviously quite young when he enjoyed his initial success with LinkExchange, and it's hard to tell wether or not there was ever any sound basis for the decisions he made. I liked his ideas on 'Ask Anything', and how a business should be obsessed with its customers in order to remain successful over the long term. The book also provides some interesting insights as to what it was like to start one's career right at the beginning of the dot-com boom, and life on the west coast during that era in general. I was amazed to learn how many high-risk, radical changes the leadership team was willing to introduce in the early days of Zappos in order to try and address problem areas. And how these radical interventions helped shape the culture and result in the business eventually turning profitable for the first time. It ain't Drucker, but if you enjoy feel-good hippie business books, or have not explored the genre before, it may be an entertaining read. Never outsourcing your competitive advantage. For e-commerce, they are customer service and warehousing. ...customer service shouldn't just be a department, it should be an entire company. Others can copy our images, our shipping, and the overall look of our Website, but they cannot copy our people, our culture, or our service. The WOW experience is extremely vital for today's business as making customers satisfied and surprised at your service quality will result in profitability and sustainable development. Not only did this book discussed about business but it also gave stunning ideas about friendship, networking and personal effort, and even EDM music and raving culture. Tony detests networking events and reciprocity, which I agree because I find those kinds of events awkward and uncomfortable. When we want to build rapport with others, we have to be their friends first. Korrina gave Sally, Crystal and I copies of this book after Christmas, urging us to read it as a little homework to become inspired for 2018. I have never read a business book before because, well, I've never really had the cause. Delivering Happiness was definitely an interesting look at customer service and working for and creating a company you believe in, which, YAY! I certainly feel that way about OwlCrate. As much as Tony Shieh's life was unique and interesting to read about, my only qualm i Korrina gave Sally, Crystal and I copies of this book after Christmas, urging us to read it as a little homework to become inspired for 2018. Recommended by Kate Burgess at FulfillNet. - Pg. 65 "Don't play games that you don't understand, even if you see lots of other people making money from them." - Pg. 136 "Ask Anything" idea. Employees are encouraged to send an email and ask any question they want. The anonymous questions and answers are compiled each month and emailed to the entire company. - Pg. 149 Re: the Culture Book..."if someone asked you to recite your corporate values or mission statement without lo Recommended by Kate Burgess at FulfillNet. - Pg. 149 Re: the Culture Book..."if someone asked you to recite your corporate values or mission statement without looking it up, could you? People wonder how Zappos employees somehow remember all 10 Core Values by heart. To me, it's simple...it's easy when your company's core values are ones that apply not to just work, but to life." "Even though our core values guide us in everything we do today, we didn't actually have any formal core values for the first six or seven years of the company's history, because it was something I'd always thought of as a very "corporate" thing to do. I resisted doing it for as long as possible. I'm jus glad that an employee finally convinced me that it was necessary to come up with core values--essentially, a formalized definition of our culture--in order for us to continue to scale and grow. I only wish we had done it sooner." - Pg. 160 "Our core values should always be the framework from which we make all of our decisions...Make at least one improvement every week that makes Zappos better to reflect our core values. The improvements don't have to be dramatic--it can be as simple as adding in an extra sentence or two to a form to make it more fun, for example. But if every employee made just one small improvement every week to better reflect our core values, then by the end of this year we will have over 50,000 small changes that collectively will be a very dramatic improvement compared to where we are today."" I was already pretty familiar with many of the more unique aspects of Zappos' customer service-oriented culture, which may be why I wasn't blown away by this abbreviated history of the company. Hsieh front-loads the reader right off the bat by warning you that the book is a vague autobiography and company history and business manifesto, but it still feels like it glosses over all three. The most interesting revelations about Zappos' founding and development was how close Zappos (and Hsieh himsel I was already pretty familiar with many of the more unique aspects of Zappos' customer service-oriented culture, which may be why I wasn't blown away by this abbreviated history of the company. Hsieh front-loads the reader right off the bat by warning you that the book is a vague autobiography and company history and business manifesto, but it still feels like it glosses over all three. The most interesting revelations about Zappos' founding and development was how close Zappos (and Hsieh himself) both were to bankruptcy during the company's early years. I like that Tony Hsieh is so straight forward about what he writes. It makes it easy to follow the story of his founding Link Exchange and then running Zappos. This isn't a groundbreaking book and the existential stuff at the end is a bit overkill for a book like this, but I appreciate the intent and I think all in all this is a great story of a entrepreneurial hustler that had some good team building habits. When he gets offered $20 million dollars f I like that Tony Hsieh is so straight forward about what he writes. It makes it easy to follow the story of his founding Link Exchange and then running Zappos. This isn't a groundbreaking book and the existential stuff at the end is a bit overkill for a book like this, but I appreciate the intent and I think all in all this is a great story of a entrepreneurial hustler that had some good team building habits. When he gets offered $20 million dollars for Link Exchange and sits down to write down what he'd do with the money. I should think through what I want to do with the money I'm hoping to earn and think about whether those things are what I really believe will make me happy. "I'd realized that whether in poker, in business, or in life, it was easy to get caught up and engrossed in what I was currently doing, and that made it easy to forget that I always had the option to change tables. Psychologically, it's hard because of all the inertia to overcome. Without conscious and deliberate effort, inertia always wins. I'd started to force myself to think again about what I was trying to get out of life. I asked myself what I was trying to accomplish, what I wanted to do, and whether I should be sitting at a different table." I should stop and think about other tables more regularly. "A great company is more likely to die of indigestion from too much opportunity than starvation from too little." Two big parts of making a good company culture are "perceived progress" and "connectedness" with others. Essentially, promoting people more often in smaller increments (or having more milestones) and helping people have more good friends at work are awesome ways to make your company culture great. Pleasure is unsustainable and is analogous to profits in terms of a business. As much as possible I should aim to fill my life with flow activities and finding a way to be part of something bigger. Delivering Happiness begins like an autobiography of the author ( one of the successful entrepreneurs ) Mr.Tony Hsieh. I felt the first section from the way he described his childhood trying to explore different business opportunities he undertook wasn’t much pulsating. It was a great comeback in the second and third sections of the book which delivered not only happiness but also many other ingredients such as motivation, passion , inspiration, core values and so forth at its best. He sets a gr Delivering Happiness begins like an autobiography of the author ( one of the successful entrepreneurs ) Mr.Tony Hsieh. I felt the first section from the way he described his childhood trying to explore different business opportunities he undertook wasn’t much pulsating. It was a great comeback in the second and third sections of the book which delivered not only happiness but also many other ingredients such as motivation, passion , inspiration, core values and so forth at its best. He sets a great example for people who are passionate for business and entrepreneurship right from their childhood and bring profit. Yes Tony was unstable after he sold his first owned company named “LinkExchange” and he wanted to run his second company for not making money or profit but to go beyond the horizon, deliver the best for everyone including employees, customers , vendors and to the entire world. It finally resulted by starting one of the best companies in the world called “Zappos”. He described the success story about zappos and the core values which makes it unique and stupendous. In the final section apart from portraying about zappos and its successful relationship with amazon he also introduced and focussed on the term happiness wherein it plays a vital role for everyone to be happy anytime. He believed that we will be in the seventh heaven when we rejoice with our real happiness not necessarily through business but in what we think, what we say, and what we do are in harmony. Overall Delivering Happiness - Happiness delivered wholeheartedly in many ways from a best real life story. Mình đọc bản tiếng Việt của cuốn sách này ở Miki, tuy nhiên phải khẳng định “Tỉ Phú Bán Giày” không truyền tải đủ lí do tại sao tác giả Tony Hsieh (CEO Zappos.com) chọn tiêu đề “Delivering Happiness” cho quyển sách. Giai thich thê nao nhi? Thực ra, tiêu đề của sách là 1 cách chơi chữ của công ty cua Tony. Zappos không chỉ “giao hàng” cho bạn, mà họ có một sứ mệnh lớn lao hơn nhiều là “giao” cho bạn cả niềm vui thích trong từng hôp giay. “Delivering Happiness” của Tony Hsieh không dừng ở khách hà Mình đọc bản tiếng Việt của cuốn sách này ở Miki, tuy nhiên phải khẳng định “Tỉ Phú Bán Giày” không truyền tải đủ lí do tại sao tác giả Tony Hsieh (CEO Zappos.com) chọn tiêu đề “Delivering Happiness” cho quyển sách. Giải thích thế nào nhỉ? Thực ra, tiêu đề của sách là 1 cách chơi chữ của công ty của Tony. Zappos không chỉ “giao hàng” cho bạn, mà họ có một sứ mệnh lớn lao hơn nhiều là “giao” cho bạn cả niềm vui thích trong từng hộp giày. 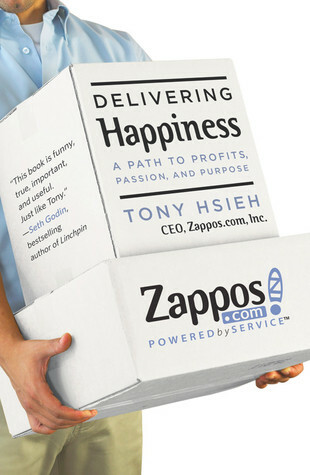 “Delivering Happiness” của Tony Hsieh không dừng ở khách hàng, mà còn nhắm đến từng nhân viên Zappos, và bất ngờ hơn: từng người đọc quyển sách sách. Những trang đầu cuốn sách thuật lại câu chuyện khởi nghiệp của chàng trai trẻ Tony Hseih (đọc là “shay”), trở về sau hình thành sự phát triển của Zappos từ một ý tưởng le lói bị Tony từ chối thẳng mặt vì tầm thường cho tới ngày công ty đạt doanh thu 1 tỉ đôla vào năm 2008 (trong khi mục tiêu ban đầu là 2010). Tóm gọn nhất cảm nhận của mình về quyển sách là: “Má ơi, đã quá!” Đã ở chỗ nào? “Đã” khi đọc và cảm thấy hừng hực về máu kinh doanh của Tony: ngay từ những ngày còn nghịch đất ngoài vườn, cậu bé Tony đã đòi bố mẹ cho tiền để nuôi bán giun lấy lời, tới thành công đầu tiên của cậu học sinh cấp 2 mỗi tháng kiếm được 300 đôla nhờ việc bán nút áo, đến tận ngày lập nên LinkExchange và bán cho Microsoft trong 17 tháng với giá 265 triệu đô. “Đã” cho tới lúc “nhà đầu tư thiên thần” Tony dốc những đồng tiền cuối cùng, thậm chí bán nhà vì anh tin vào tương lai của Zappos. Những cái “đã” khi ta đọc về Tony không phải ở những tường thuật về thành công, thất bại của anh, của Zappos, mà từng cảm xúc và hoài bão chân thật của anh ở từng chặng đường. Cái “đã” khác là những gì ta học được từ Zappos: tôn trọng phát triển văn hoá, và đặt trải nghiệm khách hàng lên hàng đầu. Với câu chuyện về công ty, Tony không chỉ dùng lời kể của mình, mà còn trích rất nhiều lá thư của các thành viên Zappos. Mình đặc biệt nhớ câu chuyện một trong những thành viên sáng lập gác tất cả công việc và cuộc sống và đi đến kho của Zappos ở một bang khác, và ở đó tới 3 tháng để “xử lý vấn đề.” Đó là một mức độ cống hiến đáng kinh ngạc & đáng học tập. Một chi tiết đáng ý ý khác là cuốn “Cẩm nang văn hoá Zappos” được tổng hợp hàng năm, là tập hợp hàng trăm bài chia sẻ cảm nghĩ (không biên tập, cắt sửa) về công ty. Điều tuyệt vời ở Zappos là dù ngày trước công ty chưa xác lập 10 giá trị cốt lõi, gần như tất cả các bài chia sẻ đều có một âm hưởng, nói về những giá trị chung. Ta có cảm từ những chia sẻ này dường như Zappos giống một gia đình siêu lớn hơn là một công ty, một điều khá bất ngờ (và dường như hơi khó tin) khi nhìn vào bình diện chung của môi trường làm việc ở nhiều nơi. Quá trình tuyển dụng “The Pipeline” của Zappos cũng là một phần đáng đọc của sách. Có một email chia sẻ một cô nhân viên Zappos mình đặc biệt nhớ là cách cô ứng dụng khái niệm “Pay it forward – Làm việc tốt chuyền tay”. 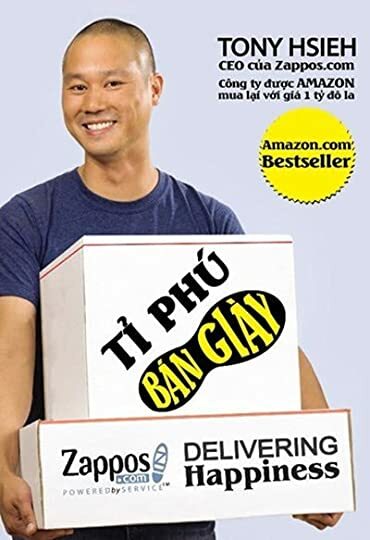 Cuối cùng, khi đọc “Delivering Happiness”, hãy chú ý vào những thông điệp thay vì nhìn vào thành công của Tony. Hiển nhiên anh ta có thể làm bạn khá choáng ngợp: lớn lên trong những điều kiện thuận lợi, và anh đậu và tất cả các trường lớn nhất của Mỹ, cuối cùng học Harvard, sau khi ra trường lại được nhận vào làm ở Oracle và dần chán việc nên lập lên LinkExchange, và bán nó với giá 265 triệu đô sau 17 tháng. Người đọc không nên so sánh với những thành quả của Tony mà nên lấy cảm hứng từ những suy nghĩ, hoài bão từ cậu học sinh tiểu học Tony, đến những chia sẻ của anh trong mỗi thành công thất bại sau này. Về mặt bản dịch, người dịch làm khá tốt việc dịch thuật các thuật ngữ kinh doanh, đầu tư cũng như về kĩ thuật. Vẫn có những chỗ dịch có cảm giác gượng do chưa có từ tương đương tiếng Việt, nhưng số lượng này rất ít và không ảnh hưởng đến trải nghiệm đọc. Cho những ai thích Tiki, như một điểm đến để mua hàng, hoặc một nơi làm việc mơ ước: Có lẽ bạn sẽ tìm được rất nhiều điểm tương đồng ở câu chuyện Zappos và câu chuyện Tiki. There are some great gems in here that make it worth reading - unfortunately scattered between a lot of personal stuff that wasn't really necessary. Gives some context, for sure, but muddies the waters a bit in my opinion. Quyển này giúp mình hiểu thêm nhiều điều chứ chưa thấm, vì mình chưa có trải nghiệm nào hay ho để thấm thía những cái này. 1 Mục lục có 3 phần chính, đó chính là 3 tầng hạnh phúc theo thứ tự, mà tác giả nhận ra được. Lợi nhuận mang niềm vui (ngắn ngủi), Đam mê mang lại gì đó cũng vui, nhưng dài hơn. Còn MỤC TIÊU gì đó cao xa hơn bản thân, thì mang lại hạnh phúc, gọi là niềm vui dài dài bền bền. 2 Tony Hsieh có danh sách Before I die, I want to...., và khi Quyển này giúp mình hiểu thêm nhiều điều chứ chưa thấm, vì mình chưa có trải nghiệm nào hay ho để thấm thía những cái này. 2 Tony Hsieh có danh sách Before I die, I want to...., và khi đã làm việc đó rồi thì gạch bỏ: cụ thể là leo nên đỉnh núi cao nhất châu phi. 3 Thăng chức nhân viên không theo "thâm niên", mà theo bộ 20 skills. Zappos vạch ra 20 skills, ai rèn tập mài giũa được 1 skills thì lương cấp 1, còn 2 skills thì lương cấp 2, 10 skills thì lương cấp 10. Xét 6 tháng tăng lương 1 lần, tạo ra sự công bằng giữa các nhân viên, chứ không có việc "lâu năm lên lão làng". 4 Ba lợi thế cạnh tranh cốt lõi của Zappos đó là: THƯƠNG HIỆU (từ dịch vụ khách hàng đỉnh), VĂN HÓA CÔNG TY ( cái rễ để làm thương hiệu), và LỰC LƯỢNG NÒNG CỐT (luôn có đội ngủ nhiều người cốt và khi ai đó nghỉ việc thì không ảnh hưởng gì lắm). Những bí quyết, bảng giá trị... bề ngoài thì các công ty khác có thể ăn cắp được, nhưng khi Zappos đã làm cho bảng giá trị ăn sâu và nhân viên, thì hầu như không ai ăn cắp được. 6 Cái gì cốt lõi của công ty thì không được thuê ngoài. Zappos đã đau đáu khi muốn làm dịch vụ khách hàng tốt, mà lại thuê ngoài cho bên thứ ba giao hàng, chuyển hàng, nên sau này, Zappos đã tự làm điều này vì đó là 1 trong 3 trụ của Zappos. 7 Khi hỏi WHY... WHY... WHY.... làm việc gì đó.. thì cuối cùng đều dẫn tới 1 đáp án: HẠNH PHÚC. 8 Sự liên kết với "các cổ đông" quan trọng ngang như nhân viên. Tony Hsieh lo hạnh phúc của nhân viên, mà quên chăm sóc hạnh phúc cho các cổ đông, nên sau này sợ bị các cổ đông sa thải, nên cuối cùng các cổ đông đã đổi cổ phiếu của Zappos thành cổ phiếu của Amazon, và lúc này Amazon chỉ là 1 cổng đông duy nhất nắm giữ cổ phiếu Zappos. Zappos và Amazon song kiếm hợp bích phụ vụ khách hàng. 9 Cái bìa sách hình Tony Hsieh bê cái hộp, có hàm ý là muốn giao "hạnh phúc" tới khách hàng, khi khách hàng mở giày ra, thì hạnh phúc. 10 Tháp nhu cầu Maslow áp dụng được không chỉ cho nhân viên, mà còn cho khách hàng, cổ đông. Và đó là 10 điều rút ra được sau khi đọc xong quyển này. Zappos' CEO Tony Hsieh has some interesting things to say about business. In Delivering Happiness, a book that is part memoir and part business development story, Tony shares the lessons he's learned from a lifetime of trying to figure out how to make money and the unexpected places that journey ultimately led him. The first part of the book covers Tony's personal history, including his first childhood attempts at turning a profit, his college restaurant efforts, and his co-founding of LinkExchan Zappos' CEO Tony Hsieh has some interesting things to say about business. In Delivering Happiness, a book that is part memoir and part business development story, Tony shares the lessons he's learned from a lifetime of trying to figure out how to make money and the unexpected places that journey ultimately led him. The first part of the book covers Tony's personal history, including his first childhood attempts at turning a profit, his college restaurant efforts, and his co-founding of LinkExchange, which would ultimately be sold to Microsoft for more than enough money for him never to have to work again. But Tony did continue to work again, including setting up a venture capital fund that invested in Zappos when it was a struggling online shoe company whose business model had yet to be proven. Ultimately driven by a desire to prove that his success with LinkExchange was not a one-time fluke, Tony ended up taking over as Zappos' CEO and investing everything he had into making the struggling company successful. Along the way, he came to see that there was far more to creating a successful company than just the bottom line, and he began pioneering the creation of the corporate culture that has made Zappos consistently rank as one of the best companies to work for in America. While Tony's personal life is interesting, it was the discussion of how Zappos and its unique culture were built over time that was the most useful to me from a business standpoint. Tony shares freely those things that he feels are important in creating a successful company culture, and I admire him greatly for setting new standards with regards to how a business can be used not just for profit, but to genuinely take care of both customers and employees in a way that much of Corporate America has lost sight of. At times, however, I also found myself frustrated with the overly general nature of the discussion. Talking about abstract concepts like mission statements is not easy, and though he made an attempt to provide examples of some things he was talking about, they often didn't hit the mark. I not infrequently found myself wishing for more specific details to help me better grasp the tangible application of what he was discussing. Despite that frustration, the book was successful in getting me to to think about what sort of work environment we would like to create for our own employees. I also appreciated the specific examples he did give of how to create a more satisfying work environment, including allowing employees to be in control of their own advancement through setting up skill sets they can acquire at their own pace. You know how a book can keep you anchored in the world full of frustration and distraction. You know when everything around you is whirling and when you open the book it's another world and you find joy and peace. Yeah that's my personal feeling with this book. I brought the book with me through continuous travels, and it's my real comfort. Not just because of the book's content, but just when I feel tired with all the social media and people and forces around me, I find the book a place to hide You know how a book can keep you anchored in the world full of frustration and distraction. You know when everything around you is whirling and when you open the book it's another world and you find joy and peace. Yeah that's my personal feeling with this book. I brought the book with me through continuous travels, and it's my real comfort. Not just because of the book's content, but just when I feel tired with all the social media and people and forces around me, I find the book a place to hide and find myself. Written in a simple, funny, attractive voice, Delivering Happiness approaches the essential issue in life and business: do things that make us happy. Throughout the book, I find the common principles that made the success of Zappos and brought Tony to the peak of wealth and fame that have brought many people up there: having passion, being persistent and hard - working, not afraid to be weird, focusing on real values, willing to share. I learned that to keep the organisation healthy and thriving, what to focus is building culture and core values, which many companies forget to build when growing fast. I learned that we actually need to make friends with colleagues (opposite with my previous thought that colleagues should only be colleagues), and we should build the team of people who we are comfortable hanging around outside of work. I learned that happiness has three types: pleasure, passion, and being part of something bigger than you. And let the last to be the first layer, then happiness will last. Yes, it's a good book. Highly recommended not only for business people. This review has been hidden because it contains spoilers. To view it, click here. It takes immense courage to write an autobiography. This is a must read book which I will suggest anyone who has the habit of reading. The book is all about business. When I mean business, I mean Customer service. Starting companies with big ideas won’t go good unless we provide dedicated customer service. An innovative idea called Link Exchange, transformed his life into a millionaire. One thing I understood from he not selling the Link exchange to Jerry is - Do not settle for less than what yo It takes immense courage to write an autobiography. This is a must read book which I will suggest anyone who has the habit of reading. The book is all about business. When I mean business, I mean Customer service. Starting companies with big ideas won’t go good unless we provide dedicated customer service. An innovative idea called Link Exchange, transformed his life into a millionaire. One thing I understood from he not selling the Link exchange to Jerry is - Do not settle for less than what you deserve.This book is indeed a pocket guide to profit, passions and purpose. Amazingly described each and every single situation the company went through from a normal online shoe shop to Zappos and then much more than imagination. I wonder what it took for them to have concepts like face game, personal emotion connection and PLUR’s. I’ll again read this book to understand being happy at work in depth. Hands down I give 5 starts for this amazing book. Ви можете витратити багато часу на читання важких, теоретичних книг, які дадуть вам різні "tools & tips". Але якщо вам потрібна перерва, але не хочете витрачати час на читання сміття, це буде ідеальна книга. Не часто можна насолоджуватися чудовою історією і все-таки забрати цілий ряд уроків ... насправді, на відміну від багатьох інших бізнес-книг, ця може кинути виклик вам робити більше, робити по-іншому і робити це зараз. Історія Тоні Шея дуже надихає. "Ключем до успішної організації є люди, Ви можете витратити багато часу на читання важких, теоретичних книг, які дадуть вам різні "tools & tips". Але якщо вам потрібна перерва, але не хочете витрачати час на читання сміття, це буде ідеальна книга. Must read from a consummate Fastlane entrepreneur; lessons about passion and violating expectations! I remember when the book ‘Twilight’ was out. You know – Twilight, that werewolf, vampire and girly romantic book? Now please, before you insult my pea-sized intelligence by assuming that I purchased this book to read it – Let me remind you, I am NOT a lover of fictional material. In fact – I HATE fiction! That too, nonsensical, childish, immature love stories. When the book ‘Twilight’ was out, my ex-girl friend - who in fact never the slightest inclination to read even a 1 paged book, kept postponing our so called pre-planned romantic dates. She had to complete reading another precious page of this foolish novel. I for the life of me couldn’t believe that she preferred the book over me. It came as a shock and a surprise to my even-more surprised ego. So after nearly a week of reading page after page, she finally completed this book and then honored me with her presence. Now what is the reason I bring up this stupid story? 1)	I never had good taste in women. 2)	A compelling & interesting book can be as addictive as any drug in the world. Though I can never for the sake of human dignity, classify ‘Twilight’ as a worthwhile book, Tony Hsieh’s ‘Delivering Happiness’ is a book I would consider, at the top of the intellectual chain. A book that takes you into the world of a 36 year old founder & chief executive of Zappos, from the challenges he faced as a child, to the mastery of musical instruments, to his naughty escapes from dedicated practice, to his first business venture – a worm farm and subsequent adventures; then from Harvard to Oracle to LinkExchange, to his early lucky break and finally into the world of Zappos – Man! I was totally glued to his book. In fact, even if you ignore everything that I just stated and then read on to the journey that took him towards his purpose – a man who kept saving himself, his company and his vision from bankruptcy and then to shoot it off to a staggering $1 Billion in sales – is a journey worth reading, studying and understanding. The beauty of this book is that is not only the true story of this man and his philosophy, it is also a Bible filled with the code of ethics, morals, principles and character that every human being, every corporation and every country should strive to follow. I was simply blown away with how he ran his company and how he incorporated acceptable rules – which, in the so called real world would be considered either impossible or close to lunacy. The book though simple and humble in its tone with its 3 main chapters - Profits, Profits & Passion, and finally Profits, Passion and Purpose; goes far beyond itself. I personally found it to be like a life saving breath of fresh air – totally honest, humorous and humane. If you want any more proof to how much you can fall in love with this book, all you do is turn to page 1. Just read page 1 and I can assure you this much – you will know that this is indeed a book you must read. Overall, A fantastic book, A worthwhile book and A truly addictive read. If you are desperately seeking one business book that you must read or a book that would have the maximum impact on the way you do business or run your life – this is the book I highly recommend. I loved this book to its very core. It's not often that I sit down and devour an entire book in one day, but today I read Tony Hsieh (CEO of Zappos') new book 'Delivering Happiness' cover to cover. Some of my favorite classes in college were the Entrepreneurship classes I took through the Wellesley/Olin/Babson consortium. Not only were we given hands on assignments that had us creating our own businesses, but we were also introduced to a large reading list of inspirational books, and perhaps most importantly we encouraged to contin It's not often that I sit down and devour an entire book in one day, but today I read Tony Hsieh (CEO of Zappos') new book 'Delivering Happiness' cover to cover. Some of my favorite classes in college were the Entrepreneurship classes I took through the Wellesley/Olin/Babson consortium. Not only were we given hands on assignments that had us creating our own businesses, but we were also introduced to a large reading list of inspirational books, and perhaps most importantly we encouraged to continue the habit of reading and learning, long after our classroom hours were over. I've read some particularly meaningful books about entrepreneurship, business, and personal development that have motivated me in the past few years - including Jim Collins''Good to Great', 'The 4-Hour Workweek' by Tim Ferriss, 'Tribes' by Seth Godin, 'Outliers' and 'The Tipping Point' by Malcolm Gladwell, to name just a few, and Tony Hsieh's new book 'Delivering Happiness' has earned it's place at the top of the list as one of my new favorites. b) because of creativity (Hsieh demonstrated success by thinking outside of the box - Zappos culture aims to empower and reward (everyone) for creativity and finding ways to adhere to their core values. The book is full of fun anecdotes of how individuals in Zappos were given control to make their jobs fun. c) because of a pursuit of happiness : Zappos wasn't just a job, for Hsieh it was a calling - working hard for something he believed in was one way to stay passionate and engaged in his life. 1. Find and cultivate passions and develop a lifelong learning habit. Know when to quit - if you wake up every Monday dreading work, it might be a good sign of it being time to start something new. 2. Sage business advice - including questions to ask when hiring new employees, considering a new job, working with investors, or working with vendors. 2. The last section of the book is about the science of happiness - worthwhile to anyone who is interested in making their lives better and more fulfilling. Side note: I managed to get an advanced copy because I was watching Tim Ferriss and Kevin Rose's random video where each had spoken briefly about how much they enjoyed the book. I immediately acted to get my hands on one, and when I went to my local tea shop I frequent to sit down and start reading my book, I looked two seats to my left, and Tim Ferriss was sitting there doing work. I opted not to be a creepy fan girl this time, but now that I've finished, if I see him again, I'll extend my thanks for the recommendation. Wow, I loved this book! I've probably had it since it first came out in 2010, but finally decided to try the first chapter since I've been reading a lot of fiction lately and thought it was time for some non-fiction. I was surprised that it immediately became hard to put down. The first part is mostly autobiographical, and Tony Hsieh shares several enjoyable and humorous stories about various entrepreneurial enterprises he got involved in in his youth to make money. He also covers starting LinkE Wow, I loved this book! I've probably had it since it first came out in 2010, but finally decided to try the first chapter since I've been reading a lot of fiction lately and thought it was time for some non-fiction. I was surprised that it immediately became hard to put down. The first part is mostly autobiographical, and Tony Hsieh shares several enjoyable and humorous stories about various entrepreneurial enterprises he got involved in in his youth to make money. He also covers starting LinkExchange with his friend Sanjay, which eventually sold to Microsoft for $265 million. This early internet success story was interesting by itself. I enjoyed seeing how his focus changed from making money and working less to being much more interested in building a company whose culture and core values aligns with his own. The latter part of the book covers Zappos and how it started, then grew into the company it is today. The part that covers the early days and numerous challenges the company faced to stay in business was very suspenseful, even though I knew the outcome. There is a lot of emphasis on the core values of the company and how those came about. I particularly enjoyed the personal stories from employees that were included to go along with each of the core values. My one nitpick here is that at some point, Nick Swinmurn, the original founder of Zappos just drops out of the story with no explanation. It seems Swinmurn left in 2006, but it was odd that this wasn't even mentioned in Hsieh's book. I love Zappos and have been a long time customer. In addition to finally finding a retailer where I can find pretty much any shoe or boot I want in my small size 5, I have experienced first hand the great customer service individual employees provide. For example, I've often been upgraded to faster shipping for individual orders, but a few years ago, a customer service rep made me a VIP (always free overnight shipping!) when I called to let them know I had accidentally returned a shoe box without checking to make sure the shoes were in it (they weren't-oops!). She got a good laugh (was I really the first person who did this? ), but provided clear instructions on how to return the actual shoes and she made me a VIP customer at the same time. I was surprised and delighted that a mistake led to such a positive experience and outcome. But that positive experience and others have made me a loyal customer and also led to much of this book feeling very believable rather than thinking the stories and anecdotes were too good to be true. My first dabble into the world of feel-good hippie business books. I've heard a lot of good things about Zappos, and since I've recently been trying to drive a higher purpose into my own customer service career I figured it may be a good time to start checking into some of these motivational / inspirational reads. That said, I've got a good sense for BS and this book passes the test as being direct and honest, much better than I was expecting. The CEO's stories begin like an autobiography, detail My first dabble into the world of feel-good hippie business books. I've heard a lot of good things about Zappos, and since I've recently been trying to drive a higher purpose into my own customer service career I figured it may be a good time to start checking into some of these motivational / inspirational reads. That said, I've got a good sense for BS and this book passes the test as being direct and honest, much better than I was expecting. The CEO's stories begin like an autobiography, detailing how he came around to deciding on customer service as a focus for his business, and the mistakes made along the way. There's a lot of talk about ways to build company culture and sticking to values because they're right, instead of compromising them for short term profits. A lot of it feels like common sense, of course, but as you're going through you begin to realize that sense might be missing from your own company, and you begin to ask why that is, and what you can do personally to bring that to the table. That's the purpose of this book. Instead of just cheerleading and talking about how awesome Zappos is, it's about proving that their approach to business is feasible, and helping other business change for the better. In the beginning chapters, Tony does accidentally paint himself as a character that's hard to identify with. He begins as a fairly lazy and money hungry boy, looking for a rock star lifestyle with a minimum amount of effort. At some point during the LinkExchange days he does suddenly mature and embrace all the values that the book is about, but the catalyst seems to be missing. Anecdotes aside, you don't have to be privileged and lucky to go through the ups and downs that piece together the story of Zappos. Tony's path won't line up exactly with anyone else, but it is a true story and has its own merits. I enjoyed reading about the story of Tony Hsieh and Zappos here more than anywhere else because of the way he tells the story. He openly admits he's not the perfect writer, but I definitely agree with some other reviewers here that it makes the story seem much more personable and believable. Although there were some positions he maintains I disagree with, the fact-of-the-matter way he talks about his background and his eventual work with Zappos makes him seem like a person who really is striving I enjoyed reading about the story of Tony Hsieh and Zappos here more than anywhere else because of the way he tells the story. He openly admits he's not the perfect writer, but I definitely agree with some other reviewers here that it makes the story seem much more personable and believable. Although there were some positions he maintains I disagree with, the fact-of-the-matter way he talks about his background and his eventual work with Zappos makes him seem like a person who really is striving to do the right thing. Whether that's the truth or just something he puts on his business card is another point entirely. I believe Tony had a great mission statement going into most of his projects, Zappos most definitely included, and I think it's a mantra that a lot of companies have adopted, especially in recent years. There are some great lessons to be learned here for anyone interested in business or just anyone looking to provide something to end consumers. I read this right after I read Isaacson's biography of Steve Jobs, and even though the two books were entirely different in tone and perspective, I enjoyed this book nearly just as much. This book is an uncensored, unadulterated account of how Tony Hsieh built LinkExchange, sold it to Microsoft and went on to head Zappos as CEO and then sold it to Amazon. I completely loved this book. There are a lot of takeaways - especially on how to build an open and transparent culture at a company, how to manage finances when the economy is down and a lot of other nitty gritty and fun parts of running a startup. Tony doesn't sugar coat anything in this book. He acknowledges when he got lucky, he also acknowledges how hard he had to work to get some things done. And that is what makes this a great read - there is absolutely nothing that would make you feel - "Oh this guy. He was extraordinary to accomplish all this". No. Tony just shows us that he was an regular, average Joe like you and me who wanted to make some money. He hustled, got lucky sometimes, and many a times showed extraordinary grit and commitment to reach where he is today. He shows by example that passion for what you do, thinking out of the box and a little courage is all it takes to be successful. ще одна книжка з низки радше практичних, аніж "літературних". і, тим не менше, у ній таки сидить муза. вона уникає повчань чи "тикань" з кожної сторінки. вона - як серіал "друзі" з усіма недоліками і класнощами емоційного плану, гг. адже створити міцнезну корпоративну культуру в іще молодій компанії, зростання якої навіть попри глобальні кризи виявило неймовірні темпи, написати книгу і породити цілий рух, який нині продовжує підживлювати тисячі молодих бізнесів? ого. це як суперзум чи googlemaps ще одна книжка з низки радше практичних, аніж "літературних". і, тим не менше, у ній таки сидить муза. вона уникає повчань чи "тикань" з кожної сторінки. вона - як серіал "друзі" з усіма недоліками і класнощами емоційного плану, гг. адже створити міцнезну корпоративну культуру в іще молодій компанії, зростання якої навіть попри глобальні кризи виявило неймовірні темпи, написати книгу і породити цілий рух, який нині продовжує підживлювати тисячі молодих бізнесів? ого. це як суперзум чи googlemaps з калейдоскопічним розширенням горизонтів від масштабу села пісківка до континентального. Delivering Happiness ! One of the best book written by the CEO of world famous customer eccentric company - Tony Sheih. From the beginning Tony narrated his interest towards business from childhood and what are the obstacles that he had faced to take his business into further levels. To be a successful organisation with the great customers, he had learned several things through out his life and he explained it in this book as three sections (Profit, Profit and Passion, Profit Passion and Purpose Delivering Happiness ! One of the best book written by the CEO of world famous customer eccentric company - Tony Sheih. From the beginning Tony narrated his interest towards business from childhood and what are the obstacles that he had faced to take his business into further levels. To be a successful organisation with the great customers, he had learned several things through out his life and he explained it in this book as three sections (Profit, Profit and Passion, Profit Passion and Purpose) which are the primary things to learn and understand. I really liked the way in which the author has taken us through his life. Even after getting successful with his first business in LinkExchange which was sold for $265M, he had went through several issues. The best thing is, he didn’t want to stop at anywhere looking behind and he focussed towards the business that he wanted to develop which resulted in the world famous shoe company Zappos.com. Every company will have its own culture and core values. Likewise Zappos also has created core values which they feel as important for their customers as well as for their employees, which is in short PLUR - Peace Love Unity Respect. Zappos is one of the best example for the successful company which attained higher level by treating their customer more friendly and their employees with more importance.